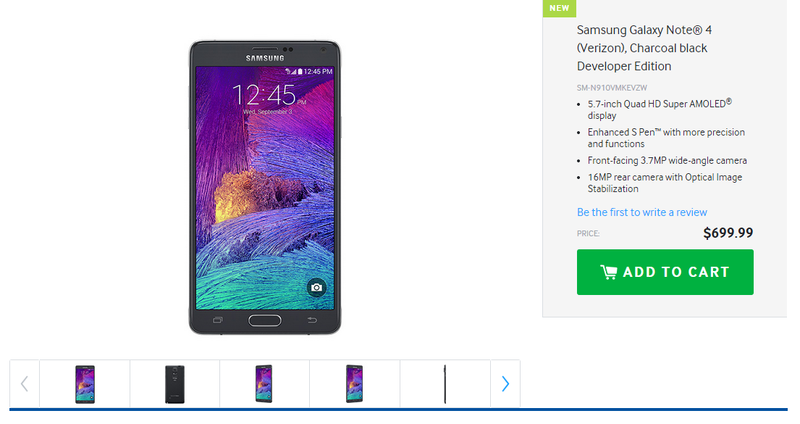 The Samsung Galaxy Note 4 Developer edition is now available on the official Samsung website. The developer edition has the same specs as the international variant but has the ability to make customization onto it. Usually the Samsung devices has unlock bootloaders but due to the certain policies by Verizon, they don’t allow it due to certain reasons. So the developer variant of Galaxy Note 4 is specifically for advance users who just play around with their devices such as modding. As I said earlier the Developer edition has almost the same hardware and software specs with a 5.7-inch Super AMOLED Quad HD display, a 16-megapixel camera with optical image stabilization, a 3.7-megapixel front-facing camera, 3GB of RAM, 32GB of internal storage, a microSD slot for further memory expansion, a Snapdragon 805 quad-core processor clocked at 2.7GHz, a powerful long lasting 3,200 mAh battery, fingerprint and heart rate sensors, and runs on the latest version of Android 4.4 KitKat. The Verizon Galaxy Note 4 Developer edition is priced at $699.99. You can learn more about the device hardware and software specs in greater details on the Samsung official website Over Here.